A credit card can give you access to money in an emergency, and if you’re looking for a way to establish a credit history, getting a credit card can help you achieve this goal. However, not all credit cards are the same. While you may be thankful for a credit card that offers a generous credit limit, your focus shouldn’t be on how much you can spend, but rather the annual percentage rate or APR. Credit card APR is the annual interest you pay for using a credit card. This is how your credit card company gets paid. And the more you shop with your credit card, the more interest you pay. Unfortunately, some consumers don’t pay attention to interest rates and they apply for any and every type of credit card. There is, however, good reason to compare rates and choose the lowest apr credit cards. Do you carry a balance from month to month? Although many financial experts recommend paying off balances in full each month, many credit card users are unable to do this. There’s nothing wrong with carrying a balance, as long as you keep your debt at a reasonable amount. But if you establish a habit of paying off your credit cards each month, you can actually avoid interest payments. A low APR credit card is highly recommended if you carry a balance. Credit card balances are a combination of charges and interest, and the amount you’re charged in interest is based on your balance. Each time you pay your credit card bill, creditors apply the payment to both your principal and interest. The more you owe in interest, the harder it is to pay down the principal. A low rate APR solves this problem. If can you reduce how much you owe in interest, a larger percentage of your payment will go toward the principal. The best credit card deal isn’t going to fall in your lap – you have to search and compare different offers. It helps to improve your payment history with your creditors, as your credit score plays a role in the interest rate you will receive. People who never miss a payment and have high credit ratings typically qualify for the best rates. If you have a credit card and you’re satisfied with your credit card company, you can always contact your creditors and ask for an interest rate reduction. This method can work if you have a good relationship with the creditor. Understand, however, some credit card companies do not offer super low rates. Know your options and research rates offered by multiple credit card companies. Before applying for a credit card, contact the creditor and ask for specific requirements. For example, some credit card companies reserve the best rates for people with scores 720 and higher. The more you understand about credit cards and interest rates, the less likely you will settle for any offer. A low APR makes good financial sense, and if you’re looking to save money or dig yourself out of debt, these credit cards can help you achieve your financial goals. 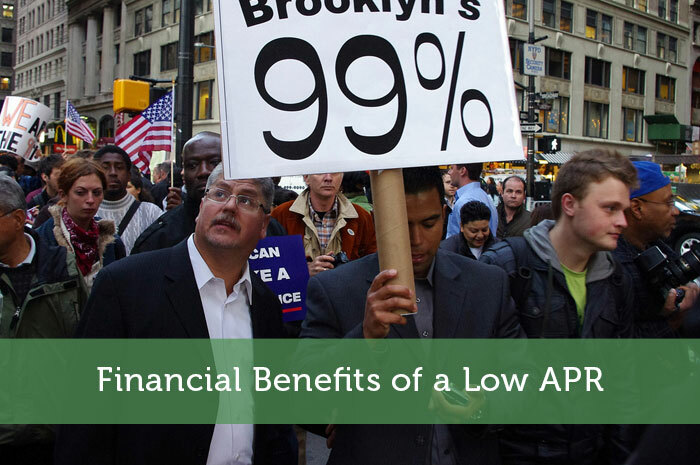 While I agree, it is much harder to get a low APR these days. People with great credit only get an APR around 12%. Yeah that’s ultimately still not a very good rate. The people with great credit are usually diligent enough to avoid carrying a balance though. I managed a 0% deal on a card, and the only cost so far has been the setup fee. It was cheaper than a personal loan. That’s awesome Pauline. I’ve had deals like that, but only as an introductory offer. I basically just used it as a loan. The sad truth is the cost of money or INTEREST is being used to discriminate. Certain people get cheap money. Certain people get expensive money. It’s all a cruel mean game. That’s why I tell people to try and make it without credit. If you can’t afford to pay cash how will you be able to afford interest? It is pretty discriminatory how interest rates are determined, but the lending companies have to protect themselves and properly manage risk. So it’s not exactly unfair that less risky lenders get the luxury of a lower interest rate. For some people it might be best to avoid credit, but I personally would rather use it to my advantage. I guess, not many of us have had the privilege of paying low APR. When most of us use a credit card, we just don’t stop ourselves from overspending or using the card just for bare requirements. Guess, we would be all the more conscience with our spending and end up with the benefits associated with low APR.